One of my favorite foods in the world is the mighty buffalo wing, and I am always on the lookout for great wings wherever I go to eat. The best wing is meaty, grilled or fried to a crispy perfection, and loaded with a spicy sauce of your choice. The main problem with many joints that simply serve wings as appetizers and don’t specialize in them is that they typically bring out tiny, skimpy wings that are cooked for a few minutes and have already gotten soggy by the time they reach your table. I have had many disappointing wings in my time, but I have learned where to go for a sure-fire hit every time. Here, I will share my five favorite places to go for wings, with those proud chicken-slingers being judged on the size and texture of their wings, as well as taste and choice of sauces. Of the five eateries, three are local places at the Jersey shore, and the other two are chain restaurants. Without further ado, I give you my Top 5 wing havens! The Boathouse, located on Main Street in Belmar, New Jersey, takes great pride in their buffalo wings. The restaurant reserves a large portion of their menu for the extensive possibilities set forth by their selection of flavors and wing types. Wing eaters have quite a choice in front of them when they look at the menu, as they can opt for traditional “bone-in” wings (either grilled or fried), or the boneless variety, and can select any of three traditional buffalo sauces that vary in intensity: mild, hot (which is a Boathouse signature sauce), and thermo, which is not for the rookies. For those that can’t handle the heat, wings can be ordered plain. Other possible flavors include teriyaki and wasabi teriyaki glazes, an Old Bay dry rub, “bee hive” honey mustard, standard BBQ (along with Bourbon and Chipotle varieties), peanut sauce (also topped with crushed peanuts), Cajun and Caribbean Jerk dry rubs, and Five Alarm, which is the hottest of the hot. I have had the traditional style wings both grilled and fried, and they come out crispy either way. The hot Boathouse signature buffalo sauce has a great kick without being painful, and the Chipotle BBQ is another solid go-to. Wings are all served with celery, carrots and blue cheese dressing. One would think that a chain restaurant showing up on a “Best of…” list such as this would bring the credibility of it down considerably, but I stand behind the wing-crafting competence of Buffalo Wild Wings. While it’s not my favorite place to sit and eat, due to the fact that I’m not a huge sports fan and any given location is usually filled with a rowdy, intoxicated crowd of that sort, all of whom erupt in a cacophony of boos and shouts whenever their team does something good or bad, the food is worth the atmosphere. They don’t offer the biggest wings on this list, but Buffalo Wild Wings serves a decently-sized wing with an excellent choice of sauces and dry rubs, ranging from mild to excruciatingly hot. The wings are usually crispy (nobody likes a soggy wing), and are doused in a sauce of your choice. Choose from seasonings such as salt and vinegar, citrus, chipotle or honey BBQ, buffalo, or “desert heat”, or from sauces including sweet BBQ, teriyaki, mild, parmesan garlic, medium, honey BBQ, spicy garlic, Jammin Jalapeno, Asian Zing, Caribbean Jerk, Thai curry, hot BBQ, hot, mango habanero, wild, or Blazin’ (the hottest of the hot). The Asian Zing is by far my favorite, and the Caribbean Jerk and hot BBQ are good go-tos as well. You get a choice of ranch or blue cheese dressings for dipping, accompanied by carrot sticks and celery. Due to the existence of the Asian Zing sauce, which is one of my favorite types of sauces in the world (I buy what is basically an identical marinade by the bottle in the supermarket to dress chicken), and the adequate size and texture of the wings, BWW takes the fourth spot on my list. It has nothing to do with the atmosphere, I swear. Seriously. My mom even drags my dad there. “I don’t care what he’s looking at,” she says. The wings are just that good. “And so are the breasts,” is usually the retort I get. There’s nothing I can say to convince you that I go there for the food, but I’m going to give it a shot. The buffalo wings are tremendous, plain and simple. They are huge, breaded daily on site, and can be drenched in anyone of Hooters’ signature wing sauces. The perfect balance of crispiness and sauciness exists in the wings here, and these chicken delights are large enough to be a dinner on their own. If you’re a purist and breading is not your thing, you can order your wings “naked”. I don’t mind a naked wing, be it grilled or fried, if it’s done right. However, the breaded wings at Hooters are too good to pass up. A night out with a few friends in Atlantic City usually results in a 50-wing chow-down, and an ensuing brisk walk down the boardwalk to work off that healthiest of meals. I won’t lie, the view doesn’t hurt, especially when the restaurant has their A-squad working, but that’s just a bonus. Aside from the A.C. location, I have also been to the spots in Burbank and Hollywood, and the food is equally good at each. The offering of one sauce puts this local bar and grille one spot from the top. That sauce goes by the name of “tres salsa”. I couldn’t tell you what’s in it, and frankly, I don’t care. You won’t either if you take my strong suggestion to go there if you’re in the area. The wings are great, can be ordered grilled or fried, and are only complimented by the restaurant’s signature sauce, the tres salsa. The sauce has since been renamed to the “Shore House sauce” or something to that effect, but to me, it will always be known by one name. There are other sauces available, such as traditional buffalo, BBQ, teriyaki, Old Bay, and chipotle BBQ, and more, if any of those tickle your fancy. The added bonus here, aside from the wings, is that all of the bar food is excellent, and the drink specials are, at times, too good to be true. The owner of the bar, Frank, is also very personable and likes to hang out with the crowd. He recognizes the regulars and will always stop to chat. The wings are a must, as is the tres salsa sauce is heavenly. Go now. Seated on North Bay Avenu in Beach Haven, LBI, NJ, the Chicken or the Egg, affectionately referred to by locals as “The Chegg”, takes the coveted top spot in my wing wonderland. Open 24 hours a day during the summer, offering a casual atmosphere and BYOB for adults, the Chegg serves up the best wings I’ve ever had. The extremely popular restaurant (be prepared to wait an hour or two for a seat during peak times) hit the motherload when it comes to their wings, offering the best size, taste and sauce choice among the wing joints listed here. Order your wings breaded or “naked”, and choose from any of 16 sauces, ranging from the mildest (teriyaki) to the hottest (ludicrous). The wings are enormous (a 6-piece can be a meal all its own), they come to you fast (making up for the wait to get a table), and are always the perfect blend of saucy and crispy. The “Santos” sauce is not only my favorite sauce on the menu, but it is the best sauce I have ever tasted on a wing, anywhere, ever. The Chicken or the Egg is a must for any wing connoisseur. 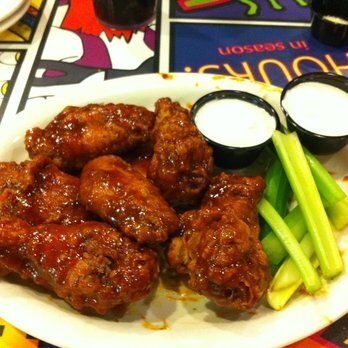 Any recommendations for a great wing place that you’ve been to in Jersey? Anything you feel could bump something off the top 5? Let me know!